With self-guided tours aplenty, Norfolk’s art scene is not to be missed. Everything from public murals to installations on local buildings have been designed for the city. 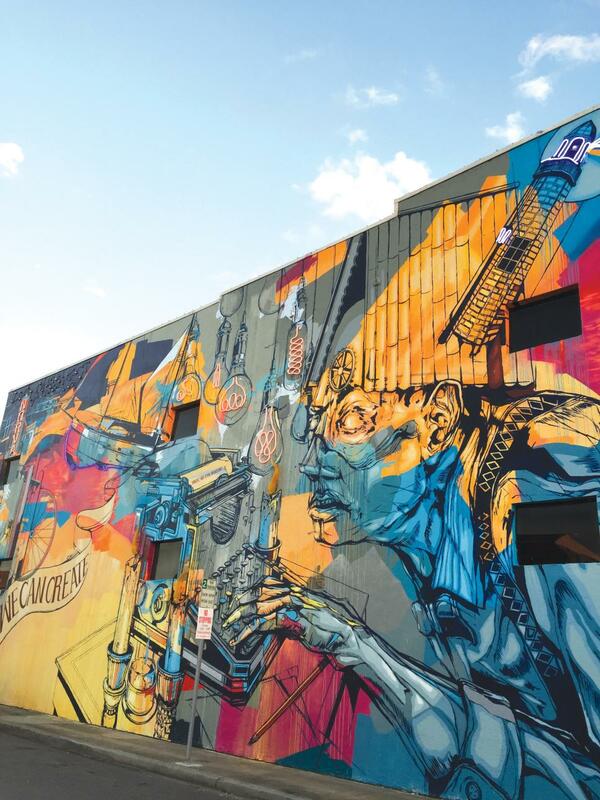 The up and coming art scene throughout the city provides a platform for artists at all stages in their career, whether just starting out or well-established, to create public murals on local businesses showcasing the city of Norfolk. Any space, whether on a building wall, a house, a shed or even the sidewalk, can be transformed into a stunning display by local artists whose love for the city is obvious in the copious ties to Norfolk painted into every piece. At the “entrance” to the NEON District is the New energy of Norfolk Mural. With classic Norfolk buildings and solar-powered lights at night, this piece welcomes you to an up and coming hub for the arts. Many of the murals throughout the city, both inside and out of the NEON District have been collaborations between local artists and Norfolk’s Emerging Leaders Program. Some, like NFK Arts are outlined by an artist, in this case, Elliott Addesso, and then students are the ones to fill in the outline. Featuring the goddess representing liberty, Fathoms of Freedom was painted by teens during the Public Art and Norfolk Emerging Leaders summer program and designed by Christopher Kozak. With nods to the North Star, various ships, and Navy symbols this piece pays tribute to the naval and seafaring history of Norfolk. Humpbacks Off the Virginia Coast is a life-sized mural of humpback whales painted by Robert Wyland as part of his quest to paint over 100 life-sized murals of marine life. Robert Wyland and the Wyland Foundation set out this goal to increase awareness and conservation efforts of aquatic habitats. This piece takes inspiration from "Animal Farm" and features different animals supporting the building, including a horse, a chicken, and a cat to symbolize how everyone must come together as a community in spite of our differences.